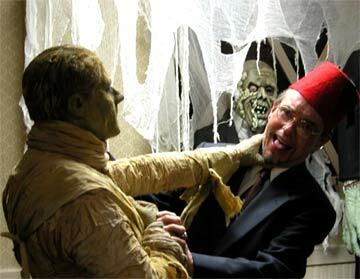 Bill Miller (The High Priest of Monster Bash) is throttled by Mark Statler (The Mummy)! Ron Chamberlain (Monster Bash Make-Up Guru), Mark Staler (The Mummy), William Max Miller (High Priest) and Ursula Adams (Ananka) in a fun little stage play at Bash! 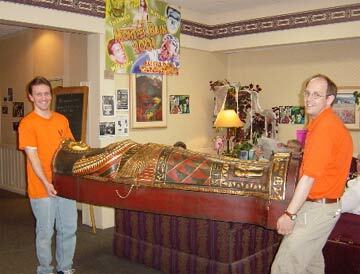 Brian and Ron Adams loading in.....the hotel never knows what they'll see from us!. 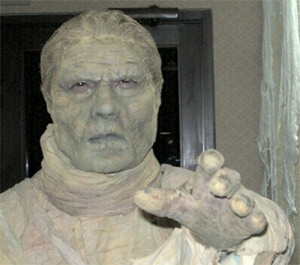 Mark Statler as The Mummy! 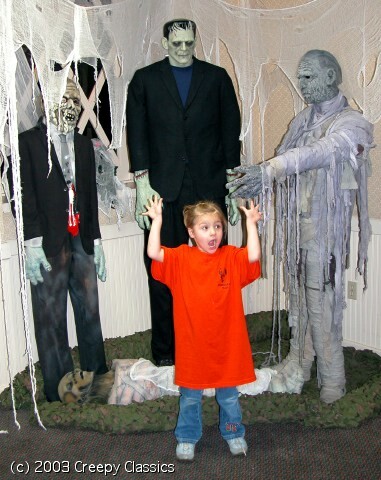 Paisley Adams is terrified (yeah, right!) 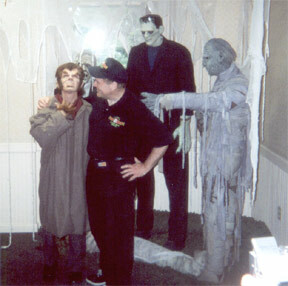 at Monster Bash 2003. 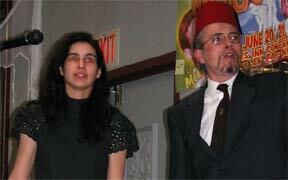 Ursula Adams and William Max Miller in the Bash's Mummy fun on stage! 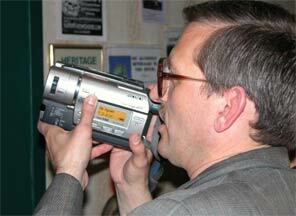 The ever-present David "The Rock" Nelson (The Ed Wood of the 21st Century) rocks on! 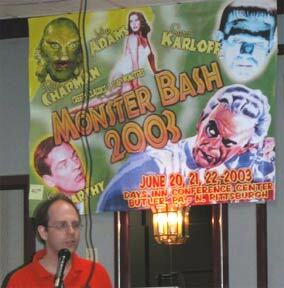 Ron greets at the beginning of Bash 2003. Sara Karloff at the reception following her talk. 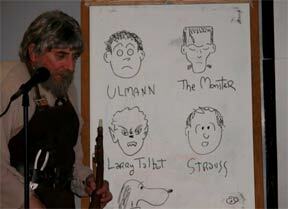 Ron Chamberlin as Uncle Boris! 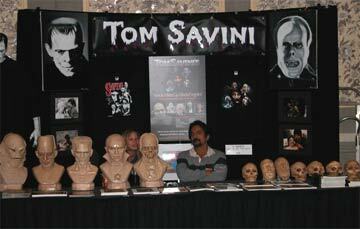 Tom Savini and his awesome display of clasic busts and...skulls! 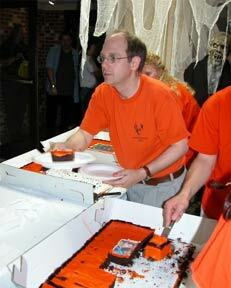 Serving 5 sheet cakes in 13 minutes to hungry Monster Bash attendees! 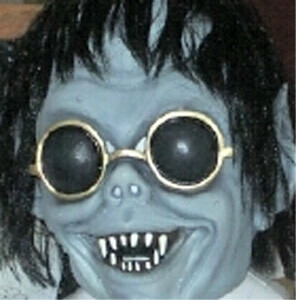 One of the many monster movie in-jokes. Handing out Tana Leaves (just like in the Mummy Movies) to attendees! 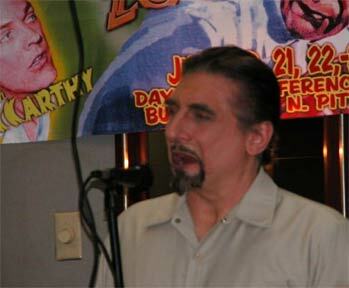 Michael Thomas as Bela Lugosi in THE INVISIBLE RAY...sernades us! 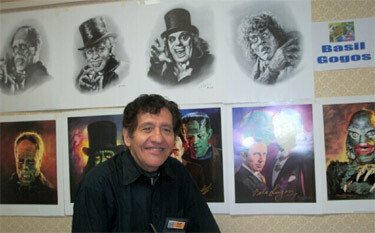 Ygor and Scarlet Street Editor Richard Valley demonstrated the blueprints for brain-swapping in the Frankenstein series! 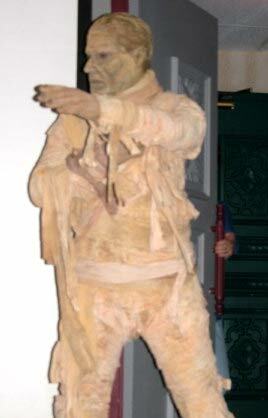 The Mummy Bashing at you! 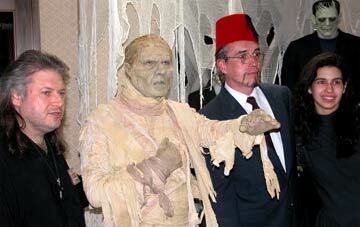 Even Sam Scare from Scary Monsters Magazine put in an appearance at Monster Bash 2003! 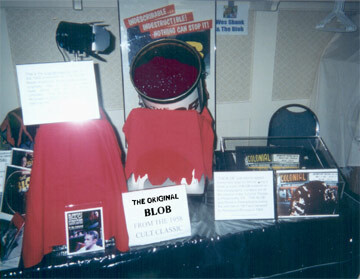 The Blob from the 1958 film makes an appearance thanks to handler Wes Shank! 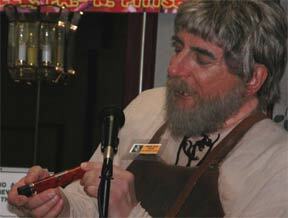 Father Mike from the Children's Hospital of Cleveland hosts the Sunday early morning church service in the Monster Bash movie room. 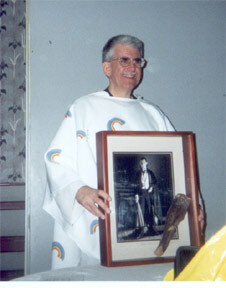 Father Mike is a big Bela Lugosi fan! 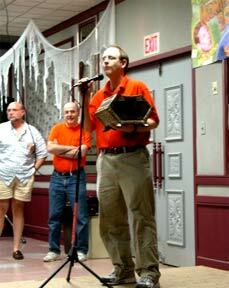 PHOTOS courtesy of Sam Minter, Barb Heiss, Greg Spencer...and many others...thank you!